The Frio 65 extreme comes equipped with two 10", no flat, all terrain tires. 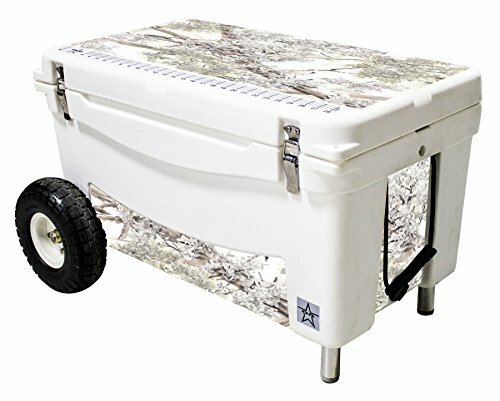 This 65 quart cooler comes with all the bells and whistles of a Frio 65 but with the added bonus of mobility. Supported by a stainless steel axle, this Frio stays put with superior aluminum pegs with non-slip feet. Aluminum retaining nuts, stainless steel screws, and custom machined axle retainers ensures that this cooler means business. Features king's camo snow theme vinyl wrap on 5 locations: front, back, lid, and both sides. If you have any questions about this product by Frio Ice Chests, contact us by completing and submitting the form below. If you are looking for a specif part number, please include it with your message.